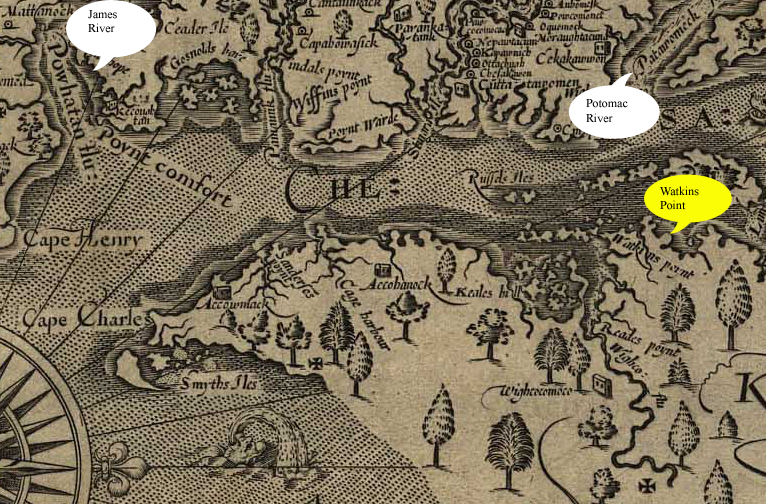 The preceding map is a section from the Captain John Smith's 1612 Map of Virginia. The top of the map is the west; the bottom is the east, and so on. I have highlighted three landmarks on this map: (1) the river called "Powhatan Flu" is today's James River; (2) the river that appears to be called "Patawromeck Flu" is today's Potomac River; and (3) on what is now known as Virginia's Eastern Shore, you will find "Watkins Poynt", the land given to James Watkins who was a member of his surveying team. Just above the compass rose at the bottom left of this picture is a piece of land called "Cape Charles" which is the name that the southern tip of the Virginia Eastern Shore has today. The large body of water that runs left to right across the middle of the map is Chesapeake Bay. In the middle of the bay are Russels Isles (modern spelling). Today these islands are known as Goose Island, Tangier Island, and Watts Island and are located slightly south of the mouth of the Potomac River. What this tells us is that Watkins Point was quite far north on the Eastern Shore of Virginia -- nearly into present day Maryland. My best guess as to where the land marked Watkins Point was located is the present day site of the Saxis Waterfoul Management Area, a large marshy area just south of the Maryland line. Watkins Point takes its name from James Watkins, a soldier in the expedition of Captain John Smith in June 1608. Watkins arrived, as a laborer, on the first supply ship to reach Jamestown in 1608. It was Smith, indeed, who named the point after James Watkins.